This chart comes from the latest Monthly Chartpack, which I just sent out to clients. 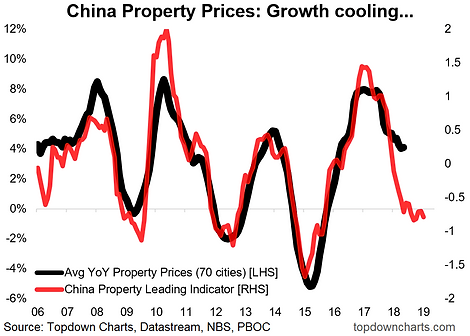 It shows Chinese property price growth through May against our composite leading indicator. The composite leading indicator incorporates money supply growth, government bond yields, swap rates, and property stock relative performance. The key point is despite some stabilization in the May property price date, the leading indicator is still pointing to a further softening in the Chinese property market. As the property market drives the broader macro/risk outlook for China (and commodities + EM), this is a key chart. Where it could be wrong would be if the seemingly over-confident consumer drove the market higher, and in Chinese asset markets we have plenty of case studies where “animal spirits” can surprise! So it’s a complex and evolving outlook, and one that I am spending a lot of time and focus on as a key driver for global markets this year and next.